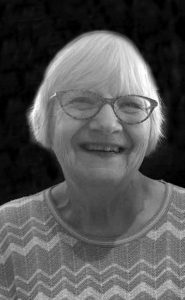 Mrs. Ingeborg “Inge” Tope of Lethbridge, beloved wife of the late Mr. Leonard Tope, passed away at Chinook Regional Hospital, on Sunday, February 3, 2019 at the age of 86 years. Ingeborg was born in 1933 in Berlin, Germany. The darkest and most tragic period of the twentieth century in Europe. She was the oldest of three girls. When she was 5 years old, her father was suddenly taken away from her. He was approached by two secret police men, who allowed him to take his daughter home and after that he was taken to the local police station and soon after sent to a notorious concentration camp. No warranted arrest, no charges, no defense lawyer. That was the grim reality of Nazi Germany. The beginning of the end of freedom for millions of people. After 18 months of unimaginable suffering, Ingeborg’s father died. The family was left destitute and had to rely mostly on welfare. Ingeborg and her sisters remained fatherless, even though her mother eventually married again and gave birth to two sons some years later. The loss of Ingeborg’s father remained in her memory all her life. At the age of nine years old, she had to be in hiding, while her mother went to work during the day. At that time, her mother became pregnant, and before the air raids started, women and children were sent into the countryside, as we had relatives in the country, we were sent to stay with them. After the end of the war, the family returned to Berlin. Her mother eventually moved to another city and Ingeborg decided to remain in Berlin. As jobs were scarce and hard to find, she decided to travel to England, domestic workers were wanted there. She traveled alone, with little knowledge of English. She obtained work in an isolation hospital and found other German girls working there, which was a powerful help. After several months there, Leonard became a staff member, he had a diploma in infectious diseases nursing. He soon became the love of her life. After a short engagement, they married in 1953 in Exeter, England. In 1955, they decided to emigrate to Canada and lived in Calgary for eight years. After that time, Len decided to get his registered nurse qualification in New Zealand, as it was possible there to learn and earn. Therefore, it took 4 years, until he finished his training. During their time there, Inge worked in a lawyer’s office. In 1967 it was decided to return to Canada, via Europe to visit relatives. The return to Canada took place in 1968. Len accepted a position in St. Michael’s Hospital and Inge eventually obtained work in the Lethbridge Public Library. After living in Lethbridge for a brief time, they moved to Coaldale into their first home. In 1974, a new phase in their life began when they adopted Byron at the age of nearly seven years old. After being a twosome for many years, parenthood became a great challenge. During the following years, Len’s health regretfully deteriorated, he therefore worked in the E.R. and I.C.U. due to the fact surgery was needed on his legs which was deemed not possible due to elevated risk. He was a very dedicated and compassionate nurse and had a profound impact on the patients he nursed. To his great regret, he had to take early retirement in 1984, at the age of 56. While he was retired, he volunteered at St. Michael’s, and took charge of shopping and cooking. In 2001, he had a fall, which sadly resulted in him becoming confined to a wheelchair. During the time that Len retired, Inge had to have surgery, which had a serious complication and due to Len’s intervention, he saved her life, as she had an arrest, which Len dealt with, before help came, therefore saved her life, due to previous work experience. The most tragic event occurred, when Len had to leave home and became a resident of an assisted living facility. Without a doubt, time there proved to be the most frustrating and unhappy experience of their lives. After long and much suffering, Len died in 2010. Inge found, that life without Len would and could never be the same again. She would miss him, as long as she lived. She had moved from Coaldale to West Lethbridge in 2006 and lived there until 2013, at which time she moved to the south side of Lethbridge. She lived an extraordinary life. While living in Coaldale, her late husband, Len, converted to Catholicism, which she did also. She preferred one on one relationships, she had many friends and was always ready to make more. She befriended a middle-aged lady for many years, a young male refugee from Myanmar in Lethbridge named Aung; and also supported a foster child in Peru. Inge is survived by her only child Byron (Heather) Tope; granddaughter Amanda; grandson Braydon all of Lethbridge; as well as her brother Dieter Naujokat of Germany. Inge was predeceased by her husband Leonard Tope. A Funeral Service will be held at 2:00pm on Thursday, February 7, 2019 at MARTIN BROTHERS RIVERVIEW CHAPEL, 610 – 4 Street South, Lethbridge, Alberta. Inge’s cremated remains will be placed with her husband Leonard in the spring of 2019 in the Mountain View Cemetery.